Researchers who want to realize autonomous swarming drones have studied the collective behavior of flocking birds and swarming insects, but a new study by a group of researchers at ETH Zurich has modeled the schooling behavior of fish. 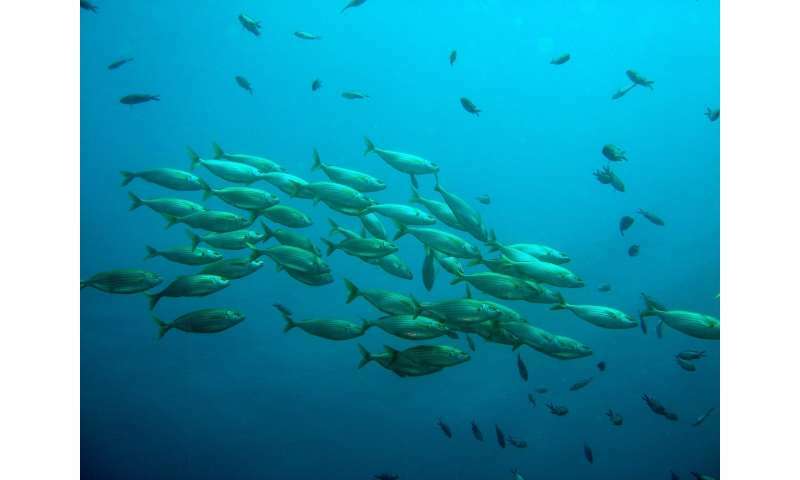 Using deep reinforcement learning, the group studied how fish draw energy from water flow and turbulence created by their own swimming schoolmates, gaining insights that could lead to low-energy, collective autonomous drone swarms. And yes, though there are many cool practical applications for the private sector and industry, militaries worldwide are interested in building fleets of autonomous swarming drones. And yes, it is creepy. Fish schooling formations cut through largely invisible flow fields that redirect the mechanical energy of water, for which fish have to compensate individually and collectively. Changes in flow are caused by tides, water redirected past objects, and the movements of fish themselves. Over millenia, fish have adapted, becoming sensitive to these changes in mechanical energy and developing the ability to extract energy from underwater flow fields. This includes harvesting energy from the flow fields generated by their schoolmates, leading to collective energy savings, akin to race car drivers drafting or slipstreaming in the wake of the lead car. A group of researchers at TKTK have published a report of their in silico study, "Efficient collective swimming by harnessing vortices through deep reinforcement learning," in the Proceedings of the National Academy of Sciences. Reinforcement learning is a field of machine learning inspired by behaviorist psychology. It's broadly concerned with the existence and characterization of optimal solutions to a problem; it's a way of teaching software agents to find the best solutions in an environment to achieve a reward. Understanding the environment fish navigate is the key to understanding schooling behavior. "There is evidence that their swimming behavior adapts to flow gradients (rheotaxis) and in certain cases, it reflects energy harvesting from such environments," the authors write. "Hydrodynamic interactions have also been implicated in the fish schooling patterns that form when individual fish adapt their motion to that of their peers, while compensating for flow-induced displacements." To prove whether this is the case, the model combined reinforcement learning with direct numerical simulations of the Navies stokes equations for two self-propelled autonomous swimmers in tandem, one leading and one following. In one model, the follower interacts with the wake created by the leader; in the second, to solitary swimmers moved in isolation in an unbounded domain. The autonomous interacting fish developed an optimal policy for efficient swimming; the solitary swimmers served as a control to assess the absence of a leader's wake. By comparing energetics data for the interacting fish and the solitary swimmers, he researchers also determined that the swimming efficiency of the interacting fish was significantly higher, with an 11 percent increase in average speed, a 32 percent increase in average swimming efficiency, a 36 percent decrease in a variable they called the "cost of transport," a measure of the energy spent for traversing a unit distance. Fish in schooling formations navigate complex flow fields replete with mechanical energy in the vortex wakes of their companions. Their schooling behavior has been associated with evolutionary advantages including energy savings, yet the underlying physical mechanisms remain unknown. We show that fish can improve their sustained propulsive efficiency by placing themselves in appropriate locations in the wake of other swimmers and intercepting judiciously their shed vortices. This swimming strategy leads to collective energy savings and is revealed through a combination of high-fidelity flow simulations with a deep reinforcement learning (RL) algorithm. The RL algorithm relies on a policy defined by deep, recurrent neural nets, with long–short-term memory cells, that are essential for capturing the unsteadiness of the two-way interactions between the fish and the vortical flow field. Surprisingly, we find that swimming in-line with a leader is not associated with energetic benefits for the follower. Instead, "smart swimmer(s)" place themselves at off-center positions, with respect to the axis of the leader(s) and deform their body to synchronize with the momentum of the oncoming vortices, thus enhancing their swimming efficiency at no cost to the leader(s). The results confirm that fish may harvest energy deposited in vortices and support the conjecture that swimming in formation is energetically advantageous. Moreover, this study demonstrates that deep RL can produce navigation algorithms for complex unsteady and vortical flow fields, with promising implications for energy savings in autonomous robotic swarms.